Reminder! Lakewood Sheriff's Station invites you to it's annual Haunted Jail! 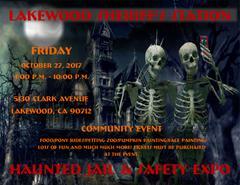 Lakewood Sheriff’s Station is hosting their annual Haunted Jail/Safety Expo, next Friday October 27, 2017. It’s time to mark your calendars and join in the Halloween spirit. The Lakewood jail will be transferring all inmates to another local Sheriff’s Station so the jail may be transformed into a Haunted Jail to scare visitors. Ghouls, goblins, clown, and headless horseman are placed throughout the jail. There will be food, games, pony rides, a petting zoo, pumpkin painting, face painting, department displays, lots of fun and much much more. Admission is free! Tickets will be sold at the event for all of the vendors and festivities.